GEORGE AUGUSTUS SELWYN, Bishop of New Zealand from 1841 to 1868,founder of the College of St John the Evangelist, named it after his alma mater, St John’s College, Cambridge in England. The College opened on 15 March 1843 at the Church Missionary station at Te Waimate, inland from the Bay of Islands where Bishop Selwyn established his first residence in New Zealand. The College was a multi-level establishment, including a theological department initially with seven students, a Maori teachers’ school, English and Maori boys’ schools, and a Maori infant school. ‘Religio, Doctrina, Diligentia’, true religion, sound learning, and useful industry was Selwyn’s motto for the College. From the out set Selwyn developed a College based on an idealised semi-monastic community. There was a common dining hall, participation in daily worship in Maori and English, a farm to support the College and train students, and a hospital. commencement. He left Selwyn a legacy which was used to purchase land in eastern Auckland in April 1844 which became the basis of the College estate. This was added to over the following years and became the endowment overseen by the St John's College Trust Board established in 1859. Purewa Creek while permanent buildings were constructed at Tamaki. The first two buildings were constructed using scoria, but from the outset there were problems with their stability. One of these buildings survives, the original kitchen / dining hall erected in 1846, now known as the Waitoa Room. Additional buildings were constructed in wood. The Collegiate Chapel consecrated in 1847 and the Dining Hall 1849, date from this early period. In 1846 the move to the present site was completed, though for some years buildings remained at Purewa, the creek serving as the port for the College. department. He also added a hostel for newly arrived immigrants and a building department that prefabricated some of the early churches in Auckland. For a short period in the 1840s St John’s operated as a community where both Maori and Pakeha lived, worked and worshipped together. Selwyn’s grand vision, however, was never fully realised, due in part to staffing and financial difficulties, and people questioning and being unwilling to support his scheme. inaugurated Melanesian Mission, an additional cultural stream was added to the College. The Melanesian Mission was relocated in 1860 to buildings on the foreshore at Mission Bay. In 1867 the Mission’s headquarters were shifted to Norfolk Island. The collapse of Selwyn’s vision resulted in the College going through a number of changes during the remainder of the nineteenth century. In the 1860s and 1870s the Tamaki site was primarily used for theological education and preparation for ministry with the Rev’d Dr John Kinder the notable head of College, 1872-80. With the opening of Auckland University College in 1883 there was a strong desire on the part of some, including the Rt Rev’d W.G. Cowie, Bishop of Auckland, to link St John’s with the University College. During the 1880s and early 1890s theological students were located at a number of places in Parnell; the Tamaki site was occupied by St John’s Collegiate School. New Zealand (commonly known as the Anglican Church) to establish a Board of Theological Studies. The Board had oversight of a syllabus used throughout the country for students preparing for ministry with four grades. Although St John’s was a provincial or national college it operated almost exclusively at this time as an Auckland diocesan college. The founding of Te Rau College in Gisborne in 1883, with the help of the Church Missionary Society, resulted in most Maori students preparing for ministry going there. Theological students came back into residence at Tamaki in 1896 with the College under the wardenship of the Rev’d Percy Smallfield, who was also headmaster of St John’s School. After the relocation of St John’s School to “the Pah” in Onehunga in 1902, the Tamaki site was used exclusively until the Second World War for the theological college and as hostel for a small number of university students. provoked a crisis and contributed to Neligan’s ill-health and retirement as bishop. Henry and Marianne Williams, stability was brought to the College. With the outbreak of the First World War the majority of students enlisted and so the College was closed in 1915. Williams served overseas a military chaplain. seven Maori and seven Pakeha students. Te Rau College in Gisborne had been closed and this led to the transfer of their students to Auckland. New buildings were erected, including a residence for the warden replacing the “bishop’s palace” which had originally accommodated the Selwyn family and also students. A large three-storied brick block which became known as the Selwyn Building was erected for student accommodation. compulsorily requisitioned for use as a geriatric hospital. was again a strong desire in the national church for St John’s to serve as a provincial college exclusively for theological students. Ongoing tension, however, over the governance of the College made this difficult and some were concerned that the College was dominated too much by the Rt Revd John Simkin, Bishop of Auckland. A new kitchen, the erection of Cloister Block in 1956, and the enlargement of the Chapel in 1959 were needed to meet the needs of an expanded student body. The opening of four flats for married students in 1962 was a rather belated recognition by the College to provide accommodation to meet their needs. Maori students during this period had no special preparation with assimilation the dominant ethos in the wider church and society. During the wardenship of the Rev’d Dr Raymond Foster, 1962-71, what he described as “the winds of theological change” touched the College. More accommodation for married students was built. In 1964 the first woman student, Sidney Koreneff, began attending lectures and the College was linked with the newly established Deaconess College in Parnell. Some students who were graduates as extra mural students began to take the examinations of the University of Otago Bachelor of Divinity degree. Greater emphasis was placed on practical training alongside the traditional academic and spiritual formation. This was a lively time as some students and staff became involved in public protests against the Vietnam War. Lectures were also introduced on Maori culture and language leading to the appointment of Canon John Tamahori as a research fellow in Maori studies. John’s and Trinity Colleges operating in partnership as two colleges on one site. The majority of the teaching was shared and the Trinity College Library was integrated into the St John’s College Library. In the early years of the ecumenical partnership, the Rev’d Dr J.J. Lewis, Principal of Trinity, 1971-80, and the Rev’d Merlin Davies, Warden of St John’s, 1974-76 worked effectively together. The partnership was symbolised in the opening the Wesley Building in 1975 which included a large multi-use hall, lecture rooms, offices for administration, the Warden and the Principal. In 1981 the new Kinder Library was opened providing excellent storage for archives and greatly improved space for books and offices and workroom for library staff. This replaced the cramped very dated quarters in the old library which was part of the Patteson building. Rapid changes took place among the student body in the 1970s with increasing numbers of students with families and growing numbers of women students coming to the College. The semi-monastic model of the 1950s no longer fitted. The impact of charismatic renewal, liberation theology, feminism and the question of inclusive language, concern over nuclear armaments and protests around race relations provided a tumultuous mix of issues that manifested themselves in College life in various ways. Through the leadership of the Rev’dDr George Armstrong, lecturer in theology, and the Peace Squadron which he founded, students and staff from the College were actively involved in protesting against nuclear ship visits and advocating for nuclear free zones. The occupation of Bastion Point on a headland close to the College by Maori protestors gained the support of some in the College. The anti- apartheid protests against the tour of the South African Rugby team in 1981 also generated considerable engagement from the College. Demonstrations in the early 1980s of those working for the Treaty of Waitangi to be honoured in New Zealand law and society were supported by students and staff. tensions and diversities” brought by the controversies facing church and society. In the late 1980s and early 1990s a number of significant changes were made to the College buildings. The Selwyn Block was demolished and the Cloisters had added to them sixteen self-contained units for single students. Faculty offices were added to the Wesley Building and a suite of lecture rooms developed under the library. College to constitute the Auckland Consortium for Theological Education (ACTE) in 1985.
which relocated from Taradale to Auckland in 1992.
others, had tried to gain approval from the University of Auckland to teach theology and now that this was available the College was reluctant to say no. ACTE began teaching the BTheol for Auckland University in 1990 with Masters Degrees and doctoral studies following later. Most of the St John’s faculty were appointed as honorary lecturers in theology at the University. administration had been based at the College, came to an end. The Board was replaced by the Ecumenical Board of Theological Studies based in Christchurch which offered extra mural study through the Ecumenical Institute for Distance Theological Studies until its closure in 2014. Polynesia was established alongside the other two tikanga colleges in 1998 with the Rev’d Dr Winston Halapua its first principal. however, and with priority being given to denominational agendas the colleges increasingly found themselves living alongside one another rather than working closely together asoriginally envisaged. University. Some of the St John’s faculty were closely involved in teaching within the school. The School’s student body included students from St John’s, other denominational colleges and a large number of University students. The teaching associated with the School of Theology was relocated from the Colleges to the university campus. Theological colleges and their parent churches felt some loss of control of the teaching of their students, the academic programme, the scheduling of worship and college life and activities. One consequence was that Colleges developed their own degrees and diplomas under the accreditation of the New Zealand Qualifications Authority (NZQA). programme. The last St John’s faculty member teaching at the University retired in 2016 and from 2017 the Auckland BTheol will be suspended. applying an Anglican lens on learning and engagement with contemporary issues in ministry and mission.” Regional delivery of the programme is also available in several dioceses outside Auckland. Students in residence at St John’s are also able to undertake degree courses in theology with a number enrolled in the distance courses offered through the University of Otago. One staff member has particular responsibility for assisting these students. The three tikanga college structure was reviewed by the General Synod in 2010 resulting in the appointment of Mrs Gail Thompson as Commissioner (2010-12) to oversee the transition of the College to come under a single leader. In 2013, the Rev’d Canon Tony Gerritsen was appointed as Manukura / Principal of the College of St John the Evangelist. The Rev’d Katene Eruera for Maori, Le Vaotgo Dr Frank Smith for Polynesia, and the Rev’d Karen Kemp for Pakeha, serve as Deans for their respective tikanga. For a detailed account of the first 150 years of the College see: Allan K. Davidson, Selwyn’s Legacy: The College of St John the Evangelist: Te Waimate and Auckland 1843 – 1992 – A History, Auckland: The College of Saint John the Evangelist, 1993. Since the time it was built in 1847, the Chapel has been the heart of the life of the community at St. John’s. It is the oldest surviving church building in Auckland and has a Historic Places Trust ‘A’ grading. Designed by the Rev’d Frederick Thatcher under the direction of Bishop Selwyn and built at a cost of £330, the Chapel was consecrated in 1847. The belfry which was not part of the original design was designed by Archdeacon Philip Walsh and added in the 1870s. 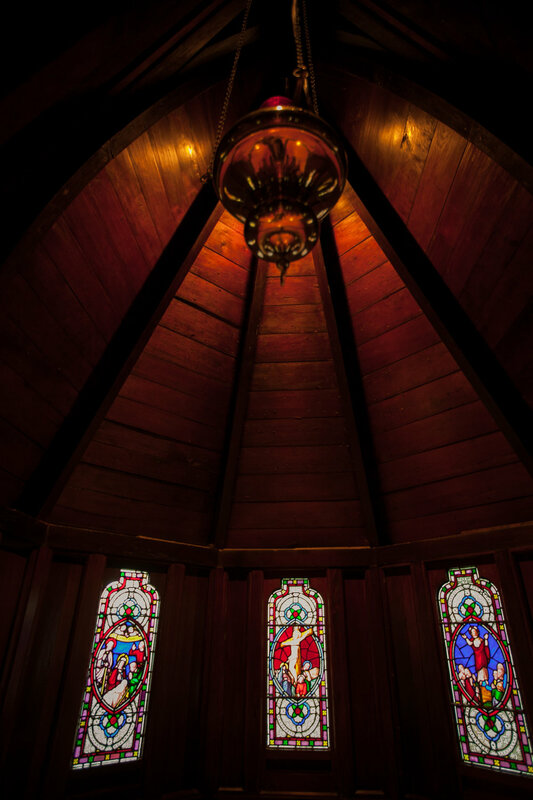 In 1959 the Chapel was enlarged by extending it to the west and matching the original kauri and totara timber in the new section. The present altar dates from 1934 and the altar candlesticks are made from wood from the parish church of Boston, Lincolnshire. The bell is made from metal from bells originally in York Minster. The Waitoa Room is the oldest of the original buildings (the Selwyn coat-of- arms is over the fireplace and dated 1846). Originally this was the kitchen and dining hall where the Bishop and Mrs Selwyn, College staff and students dined until the Dining Hall was built. Rota Waitoa, after whom this room has been named, was a student of the College from 1846-1853 and was the first Maori to be ordained: Te mātāmua o ngā minita Māori. The room contains a number of taonga (treasures), including a fine whakairo (piece of wood carving) depicting Rota Waitoa. This whakairo was executed and presented to the College by Huia Hapai Winiata, former Bishop of Wellington, who was a student of the College in 1975-76.
and on the right is John Kinder (Master 1872-1880). The large portrait opposite the door is of Percy Temple Williams (Warden 1910-1924). College. Alongside the entrance to the Chapel are the graves of Bishop Simkin and his wife. Bishop Simkin was the Secretary of the Board of Governors from 1926-1940, and Bishop of Auckland and Chairman of the Executive Committee of the Board from 1940-1960. Just behind the Chapel is the memorial headstone for the Right Reverend Sir Paul Reeves (1932- 2011) who was closely associated with the College as a student, onetime lecturer, Governor and Te Ahorangi of Te Rau Kahikatea. He was Archbishop and Primate from 1980 – 1985 before serving as New Zealand’s first Governor General of Māori descent from 1985 – 1990. The columbarium beyond the Chapel provides a niche wall designed to hold ashes. Built to complement the Chapel, it is administered by the St John’s College Trust Board.